The 2020 Toyota Corolla is set to continue Toyota’s dominance in the compact economy sedan category. The Toyota Corolla is the best-selling vehicle of all time, with over 46 million cars made and sold. Part of the reason for that record is that the Corolla has been around in various forms since 1966, but the main sales driver has always been that a Corolla is an affordable and reliable compact car, well suited to commuters, first-timers, and anyone who needs basic transportation. 2020 is the first year of the 12th generation of Toyota’s bread-and-butter small car, and it remains true to the Corolla tradition of affordable mobility. Yet the new Corolla also brings the right set of features for the next decade, including a hybrid option without a big price bump, plus a full suite of advanced safety and convenience features as standard equipment. Including required fees, the 2020 Toyota Corolla starts at $20,430, and the most expensive trim with every option tops out at $27,940. There are a few trim and option choices in the economy, sport, and hybrid categories, but a reasonably equipped Corolla in any category can be specified for less than $24,000. Let’s cut to the chase: The 2020 Toyota Corolla looks like a Japanese economy car. It’s no Supra. It’s not ugly, and it’s not a head-turner. 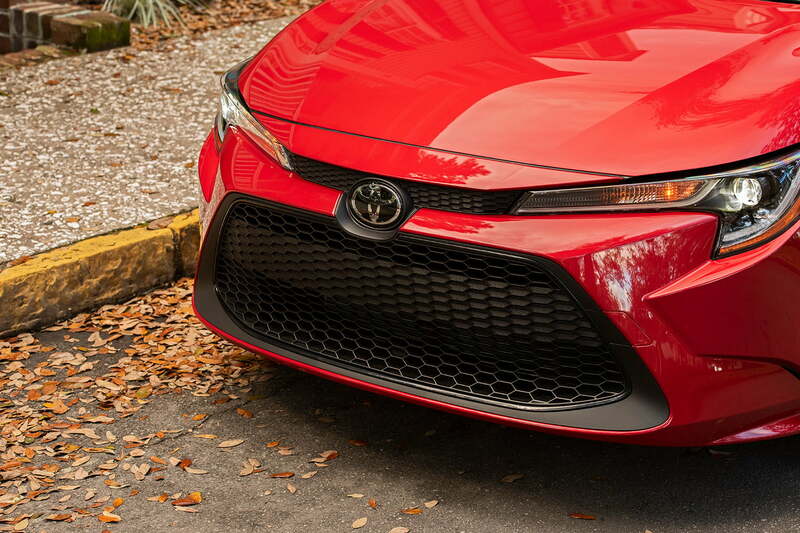 You could go back and forth over the new grille design or the shape of the headlights, but the bottom line is that the Corolla’s form follows its function. It’s a four-door compact economy car. The design is current and there’s certainly nothing wrong with it, but it’ll never end up on a poster in some aspiring teenager’s bedroom. The interior is by far the most important part, and here Toyota has done a great job at making the Corolla seem more expensive than it is. The vinyl and plastic are generally soft-touch, and the higher trims offer more soft and fewer hard surfaces. 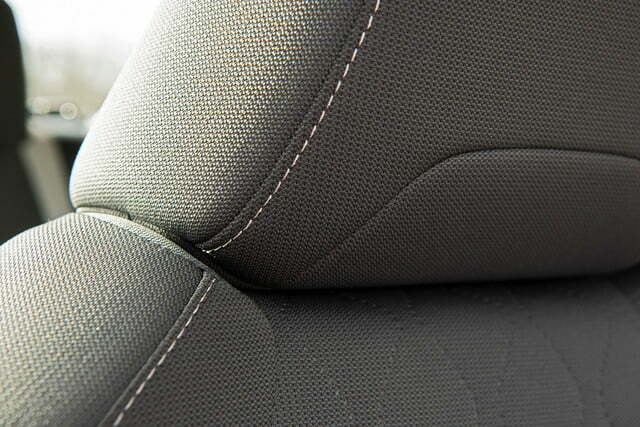 The seats are comfortable enough, though we wished for an adjustable lumbar support in the mid-grade LE and SE trims. The top XSE and XLE trims get a power lumbar support, which is nice. 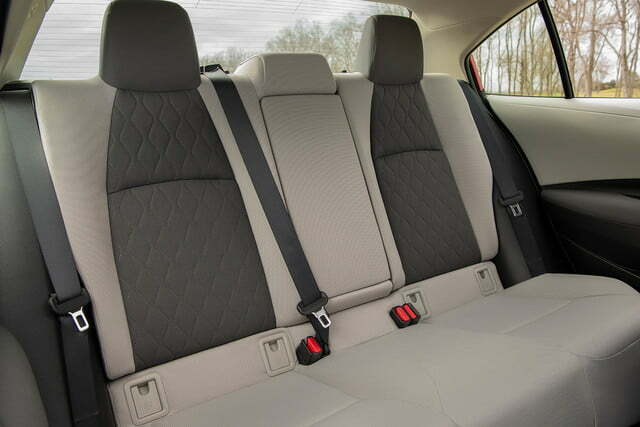 We found the Corolla roomy enough for two six-foot tall men in the front seats. The door panel doesn’t unnaturally crowd your outboard arm, and there’s enough space between the seats to avoid knocking elbows. 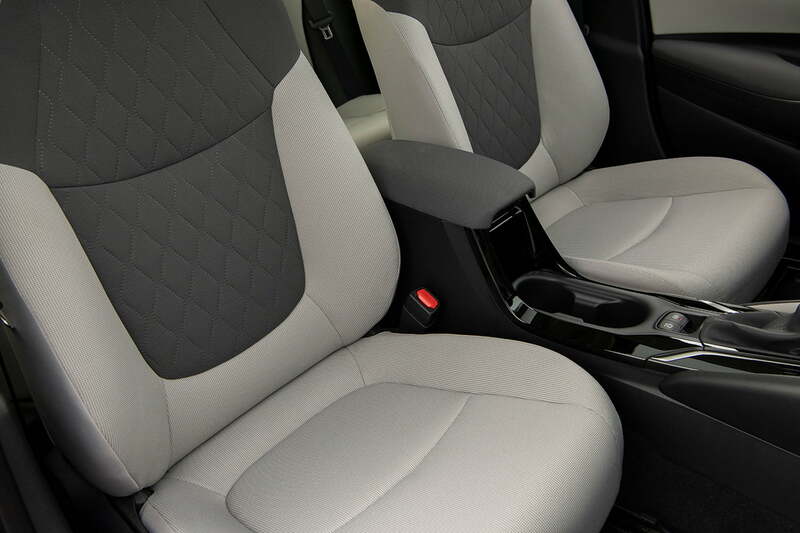 With the front seats adjusted for adequate knee room, another pair of similarly-sized men can get in the back seat and be comfortable. The Corolla trunk offers 13.1 cubic feet for your stuff, and the back seats fold down to accommodate longer items. That’s on the low side for the segment. The Nissan Sentra boasts 15.1 cubes, while the Honda Civic sedan checks in at 15.1. Notably, the new Corolla offers excellent visibility all around the car. A narrower A-pillar and sloped hood increase forward visibility, and the Corolla generally provides good rearward sight lines as well. Available blind spot monitoring covers the sides of the vehicle conveniently. The standout reason to buy the new Corolla over its main rivals is its impressive array of standard driver convenience and safety technology. Toyota has given every new Corolla the Toyota Safety Sense 2.0 suite of features, including adaptive cruise control, pre-collision mitigation with pedestrian and cyclist detection, lane departure assistance with road edge detection, automatic high beams, road sign recognition, and lane tracing assistance. These features tend to show up in expensive option packs even on cars at twice the price of the Corolla. 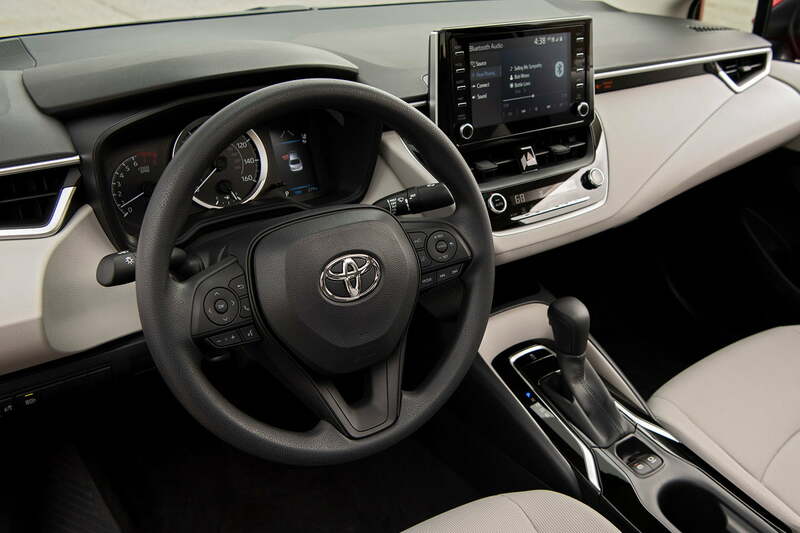 On the dashboard, most Corollas get an 8.0-inch touchscreen infotainment system with Toyota’s Entune app support system. The absolute base L trim gets a 7.0-inch screen, but the price difference between L and LE is only $450, and that’s well worth the upgrade. The infotainment system gains features like onboard navigation and satellite radio as you ascend the trim ladder, but all of the 8.0-inch screens support GPS Scout, Apple CarPlay, and Amazon Alexa. 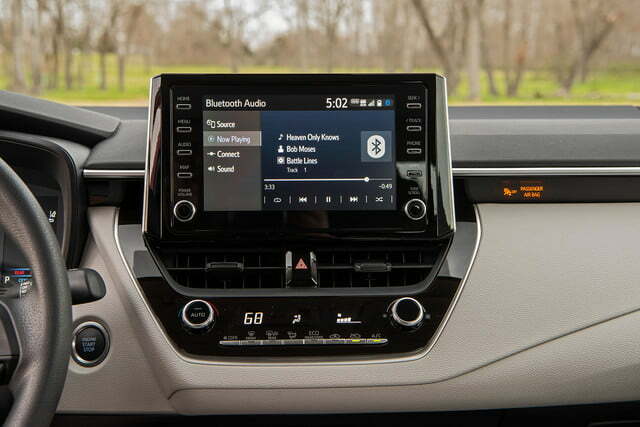 However, the Toyota system does not support Android Auto. A JBL premium audio system is available as an option on the top XLE and XSE trims, and on the SE sport trim. 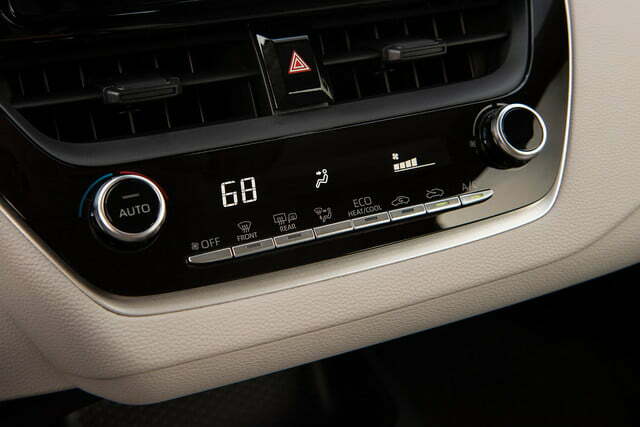 The last tech feature to mention is the driver information display, which is a standard 4.2-inch unit on the L, LE, and SE trims, and a 7.0-inch unit on the XLE and XSE trims. 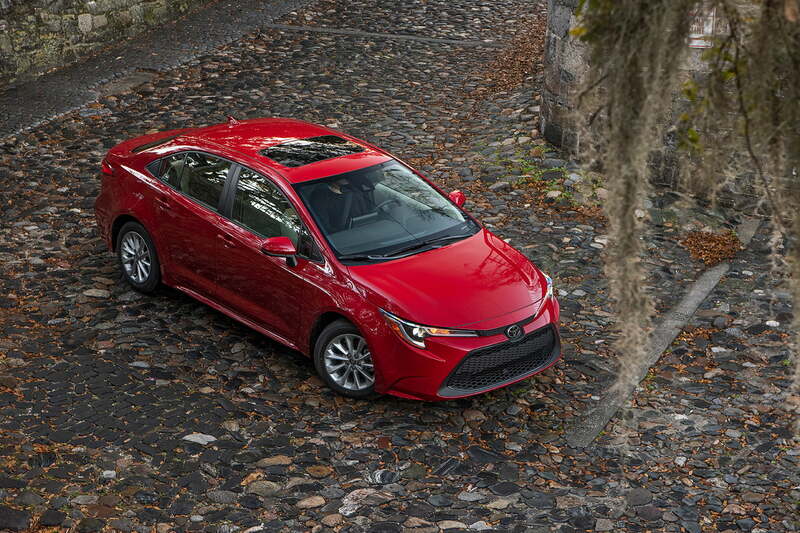 The new Corolla uses front-wheel-drive and comes with three engine packages that define the trim ladder. 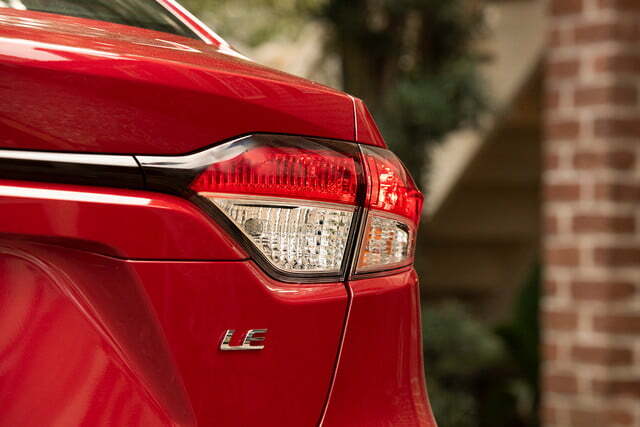 The L, LE, and XLE economy models use a 1.8-liter engine with 139 horsepower and 126 pound-feet of torque and a continuously variable transmission. The SE and XSE sport trims get a 2.0-liter engine rated at 169 horsepower and 151 pound-feet. The sport trims can be purchased with the CVT or with a six-speed manual transmission. Finally, there’s an LE Hybrid, and this model gets an alternate 1.8-liter engine with 121 net horsepower and 105 pound-feet of torque. Before you cue the sad trombone, remember that hybrid power is measured at the wheels, while conventional engine power is measured at the website. There’s really not that much performance difference between any of these models. Yes, you’ll get some more grunt out of the 2.0-liter in the SE or XSE models, but if you want a sports car you’ll be better off driving the Toyota 86. The main thing to know about driving the 2020 Toyota Corolla is that it’s unremarkable. 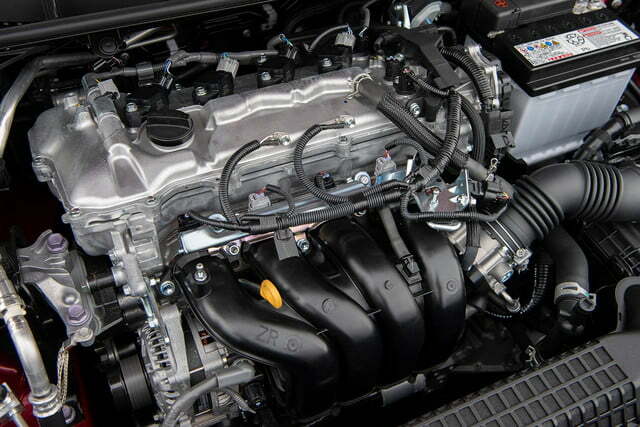 Engine power is adequate in any of the trims, and the CVT works like a CVT. You won’t find a big disparity here against the Honda Civic or Nissan Sentra. If you choose the manual, be aware that the stick and the clutch have a strange, disconnected sort of feeling related to the anti-stall and rev-matching technology. On the road, the Corolla drives well and responds nicely to steering inputs. The lane tracing tech that comes with the Toyota Safety Sense suite is interesting, but not fully developed. 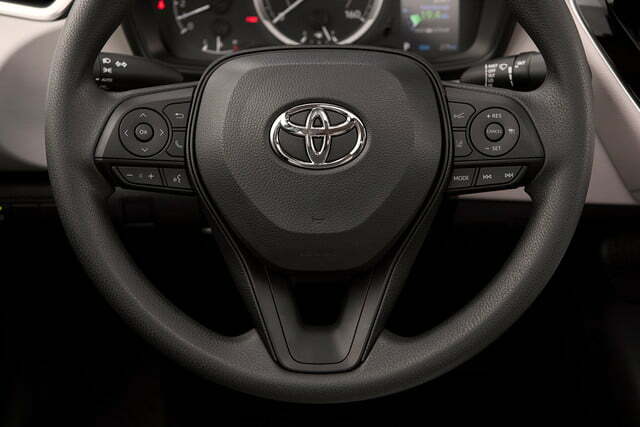 The idea is that the Corolla will keep itself centered in its lane when the adaptive cruise control is working. The lane trace works, but it’s easily fooled if the white lines aren’t there. 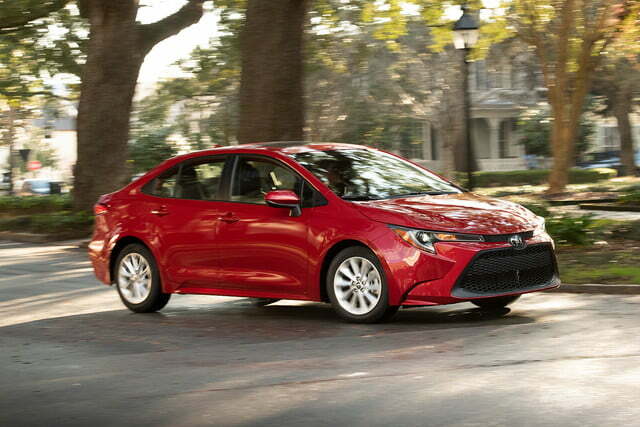 Overall, the Corolla boasts a quiet and comfortable cabin and good driving manners. At the price point, this is an exceptionally competent car. EPA fuel economy ratings are good, up to 30/38 for the 1.8-liter and 31/38 for the 2.0-liter with the CVT. 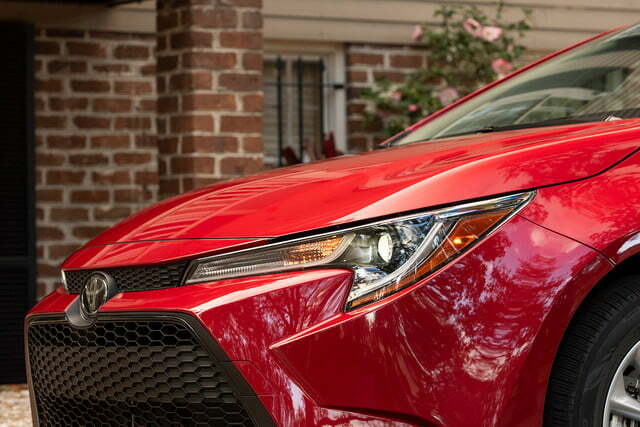 The Corolla hybrid really raises the stakes, however, with 53 mpg city and 52 mpg highway. If you’re buying for economy, the hybrid is the obvious choice. It’s one of the most efficient cars in its competitive set. The notable rivals to the Corolla are the Honda Civic and the Nissan Sentra. Together with Corolla, these models are the consistent top three in compact car sales year after year, though Hyundai Elantra is nipping at the Sentra’s heels at this point. The 2019 Honda Civic tracks the Corolla very closely in pricing and features, starting at $21,170 including all fees and a CVT. Like the Corolla, Honda offers adaptive cruise control and advanced safety features as standard equipment, plus a 158-horsepower engine. The 2019 Nissan Sentra comes in a bit lower at $19,375 for the basic S trim with a CVT. The Sentra comes with a 1.8-liter engine at 124 horsepower. 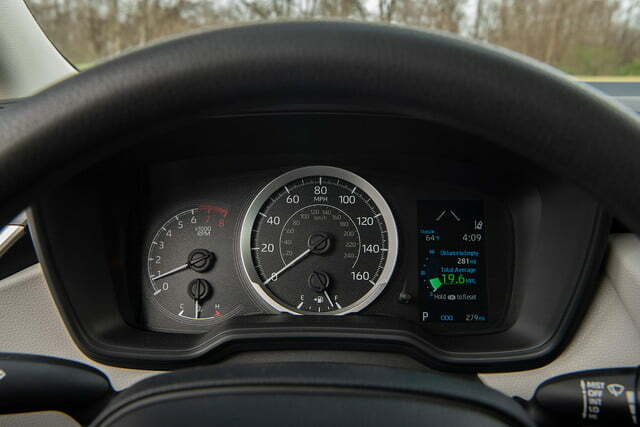 The Sentra comes with automatic emergency braking, but adaptive cruise control is not standard. Toyota provides the Corolla with its basic warranty coverage of three years or 36,000 miles on everything, and five years or 60,000 miles on the powertrain. All scheduled maintenance is covered for the first two years. 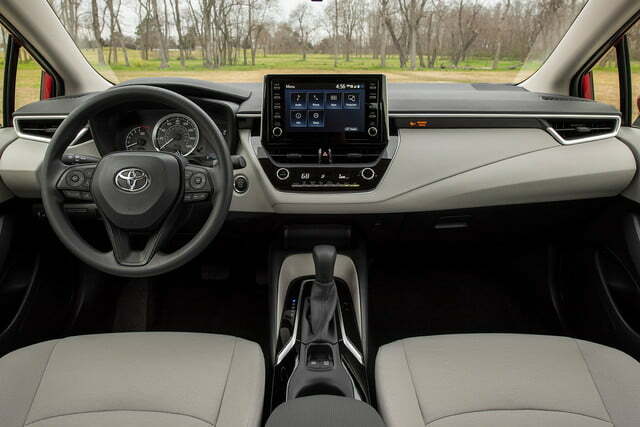 The 2020 Corolla is based on an entirely new architecture, but the 2019 Corolla received a five-star safety rating from NHTSA and was a Top Safety Pick by IIHS. It’s reasonable to expect the 2020 model will fare just as well. The 2020 Toyota Corolla is poised to continue its 53-year streak as a best-selling economy car, but from the DT perspective, the most compelling model is the first-ever Corolla hybrid. 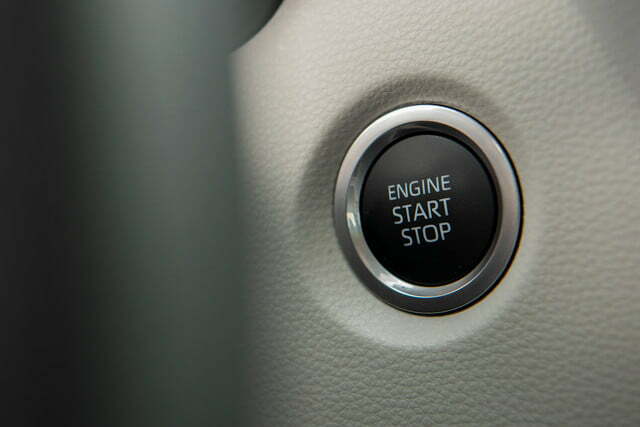 The hybrid comes only in the LE trim level, but adds a few features like push-button start that are optional on the gas-powered LE. The Corolla hybrid costs $23,880, and the only available option is a special paint color at $395. A comparably equipped Corolla LE with the premium package comes in at $23,129 with a moonroof and blind spot monitoring to further sweeten the deal. If you choose the sporty SE with a manual transmission, you’re looking at $23,580 for a comparably-featured car with the moonroof but without the blind spot system. The SE with the CVT comes in a bit cheaper at $22,880. With no great difference in on-road performance or price, there’s very little reason not to choose the hybrid option. 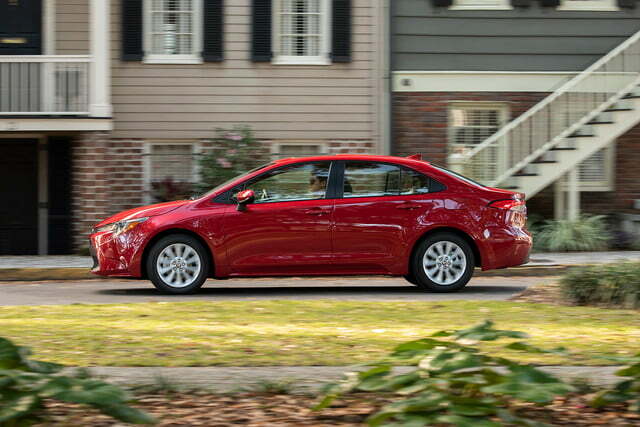 An average fuel economy bonus of 20 mpg is significant over time if you’re buying the Corolla as your daily commuter. A Corolla has always been a sensible and affordable choice, and that value continues with the new generation. 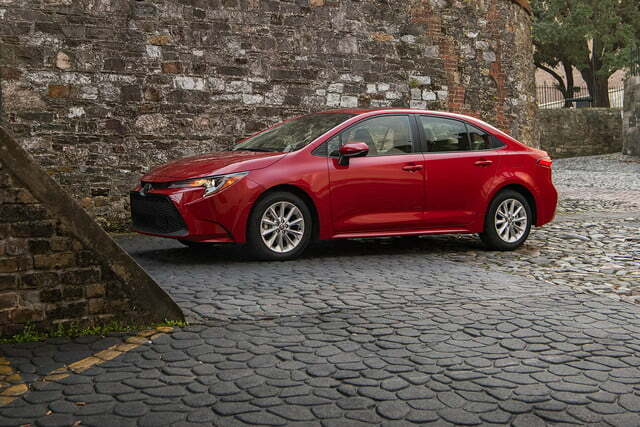 Toyota tells us that 24% of Corolla buyers are first-time new car buyers, and the Corolla remains oriented towards that value-conscious customer. When you consider the standard features and easy availability of an economical hybrid system, there’s every reason to expect that the 2020 Toyota Corolla will continue as a sales leader.